Sextus Empiricus: Against Those in the Disciplines (Pros Mathematikous, also known by the abbreviated title M 1-6) deals with six specialized fields of study: grammar, rhetoric, geometry, arithmetic, astrology, and music. In sceptical fashion, it questions the credentials of those who claim to have expert knowledge in these fields. It is the least well known of Sextus Empiricus’ works, mainly because its subject-matter is not directly philosophical; some of its arguments require knowledge of these fields as they existed in the ancient world, which philosophers (Sextus’ main readership) tend not to have. But it is a good specimen of Sextus’ usual sceptical method of inducing suspension of judgement about the topics under consideration, and it contains much that is of philosophical interest. This volume aims to bring this work to a wider philosophical audience and to make the technicalities of the fields discussed understandable to non-specialists. It contains a translation of the work into clear modern English, accompanied by extensive explanatory notes. For ease of comprehension, the text is broken down into named sections and subsections, and these are also listed separately before the translation (the Outline of Argument). 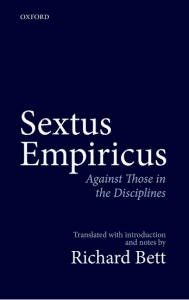 An introduction discusses the place of Against Those in the Disciplines in the totality of Sextus’ work, and examines certain features that are distinctive to it. Other aids to the reader are a list of persons referred to in the work, with brief information about each; an English-Greek and Greek-English glossary of key terms; and a list of passages in other works of Sextus that are parallel to passages in this work.